Aside from Back to the Future, this is my favourite film ever. One reason for this is that the 1900’s have always proved to be particularly interesting to me, especially the Second World War. A second reason is that I have studied German for seven years including the country’s history and so, the topics that this film covers interest me greatly. 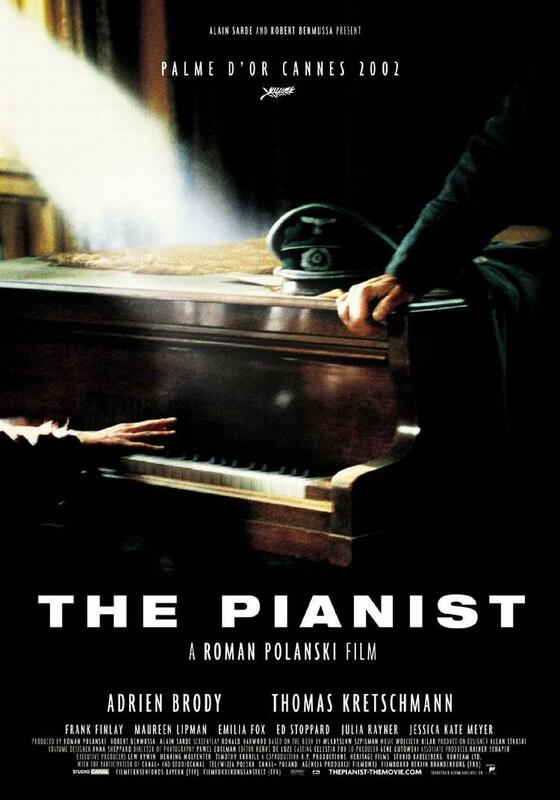 The basic plot of the film, which is based on a true story, follows one man, Wladyslaw Szpilman (Adrien Brody), a Polish Jewish pianist who plays for Polish radio, and we see how the Holocaust affected him and his family. The film sees them herded into the ghettos and then transported to the work camps, but Szpilman escapes and then has to survive in Nazi-controlled Poland undercover and out of sight from prying eyes until the war is over. This is harder than may be first thought and there are many times where Szpilman narrowly escapes death. The film’s main target seems to be to tug at the audience emotionally and show them the struggles for life as Szpilman tries to survive outside of the law. Many films have been made depicting how the Jewish prisoners were treated inside the camps or how they managed to survive the Holocaust, but this one uniquely tells the audience a truly magnificent story of how one man is able to defy the Nazis outside of the camps, as some managed to do. In this way, the film does not follow traditional codes and values, but ventures outside of the box with a mix of emotional scenes and shocking scenes. I will admit, at some points in the film I was very shocked at how some of the Jewish were treated. It is obvious that the film is not completely true and some parts will have been exaggerated for the purposes of the film, however, I believe that these fit well with the tone of the film and I’m sure that some of the things that happen in the film will have happened in real life, having gone unnoticed. The feature is filmed beautifully with deep and dark filters and effects on each scene when Szpilman is in the ghetto or in hiding. This comes into complete contrast with the colours of the beginning, ending and part of the middle of the film. The colour adds a sense of relief, but only makes the grey scenes seem ever darker and greyer. Brody is a fantastic actor and portrays Szpilman perfectly; you really get a sense of the pain and suffering felt by him throughout the film. He is quiet and often keeps to himself and doesn’t look at all like the average hero you may see in other films (and by this I mean the geek heroes that always save the day anyway) – he is a completely average man who he determined to save himself and his family. Be prepared with tissues and for a few laughs; it’s not a depressing film, just very, very interesting.